While at the BTTF party on 10.21.2015, please make sure to visit the GIRLS OF THE CON booth – just look for the big "Save The Clock Tower" banner. There you will be able to pick up your commemorative 1.25" pins, as well as enter the TEAM FOX raffle/auction – with 100% of proceeds to benefit TEAM FOX. Below are a few of the items that will be given away as prizes – thank you to all of our donors and artists for these great items! Sure, it can't fly but it'd sure look awesome displayed in your geek room! Only 1 HOVER BOARD to be raffled/auctioned off! GREAT SCOTT!! Atlanta artist Chris Hamer of Urbnpop.com illustrated this BTTF/Doctor Who mash-up cover just for this event so it's truly one-of-a-kind. Different "vehicles' to travel through time but when you start thinking about it, there's more in common with the "doctors" than most "non-time traveling fans" may realize. Do you consider yourself a social geek? Feast your eyes on this baby....a golden MarksterCon.com Party Pass!! What exactly IS a MarksterCon.com Party Pass? Well...it will get you into every MarksterCon.com event for a year (18+ or 21+ only, depending on the event). Yep...for an entire year. Less than 5 of these exist in the entire world (comes with gold/diamond style neck lanyard). Donated by our friends at Under The Slab, this beautiful obsidian wearable will be the key to any of your future time travels! 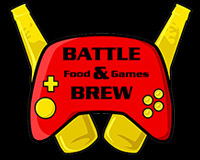 Make sure to visit Under The Slab during the BTTF event as they'll also be on hand vending their beautiful creations! Atlanta's coolest bar/restaurant Diesel Filling Station has donated Diesel Bucks for lucky winners! What is a Diesel Buck? Same as cash but you put it towards your next visit. Diesel is a stable venue in the Atlanta geek scene – hosting Atlanta's largest The Walking Dead weekly viewing parties, as well as the annual Zombie Pub Crawl (on July 30th, 2016), the Hogwartz Pub Crawl (on Dec. 4th, 2015) and BAR WARS: The Crawl Awakens on Dec. 11th, 2015. 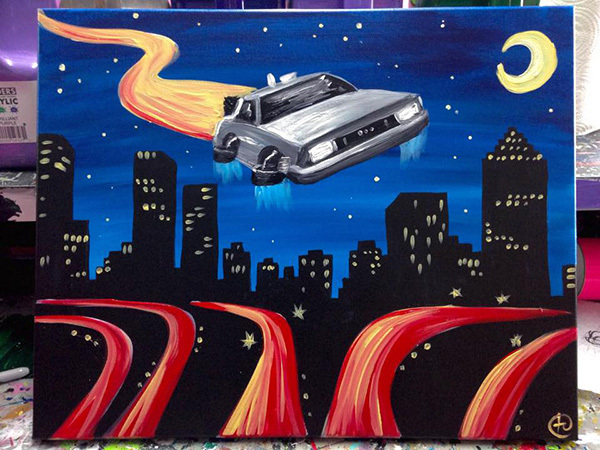 Atlanta artist Tamara Comstock created this beautiful "DeLorean Over Atlanta" 16' x 20' acrylic on canvas and some lucky person will be taking it home with them on 10.21.2015. Tamara is an both an artist and art teacher at Masterpiece Mixers in Snellville, GA.